Although scientists say that this new thermal area is just simply a normal part of Yellowstone’s dynamic hydrothermal activity, the area has been slowly forming over the past two decades. Not only that, but it was just recently spotted using infrared images of the existing Tern Lake thermal area. 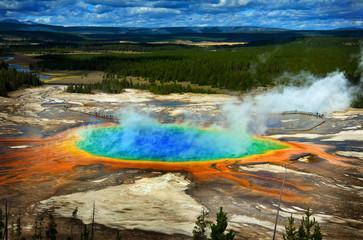 Obviously trying to quell the amount of talk about a supervolcano eruption, scientists insist there is no eruption coming to Yellowstone. According to a report by Weather.com, the new area is entrenched deep in Yellowstone’s backcountry between West Tern Lake and the previously mapped Tern Lake thermal area. The U.S. Geological Survey confirmed the thermal area’s location earlier this month while downplaying any potential for an eruption. “We’ve heard many statements that Yellowstone is overdue — that it has a major eruption every 600,000 years on average, and since the last eruption was 631,000 years ago… well… you can see where this is going,” Michael Poland, scientist-in-charge of the Yellowstone Volcano Observatory, recently wrote in a blog post.